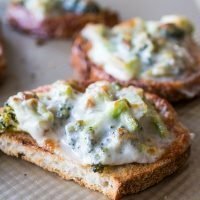 These quick and easy broccoli melts are for the nights when cooking a full meal just feels miles away. You know those nights when you’ve got nothing left in the tank to cook a proper meal? 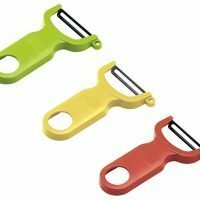 When cheese, crackers, and wine will make a perfectly perfect dinner because OMG no more cooking and no more dishes! When it’s too hot to even cook on the grill. When you’re struggling to find another light meal for a hot night that the whole family will actually eat. 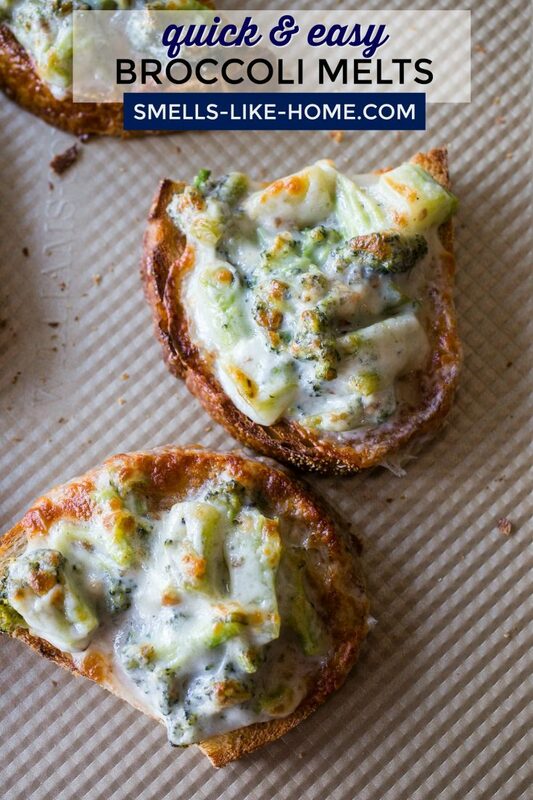 Yes, these quick and easy broccoli melts are part of your salvation. The other part? And yet, if you follow me on instagram, you’ll know these broccoli melts also make the best lunch ever. 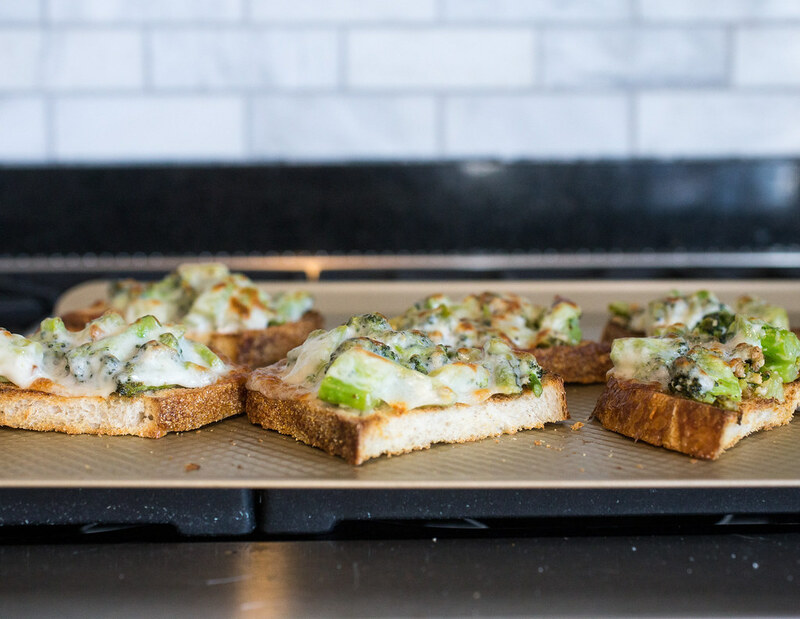 I’m positive these garlicky broccoli melts would also make for an easy-going and healthy-ish dinner when the kids are jumping in and out of the pool this summer (paired with a salad or some fruit) or when you’ve finally got them settled down for a movie night in lieu of pizza. 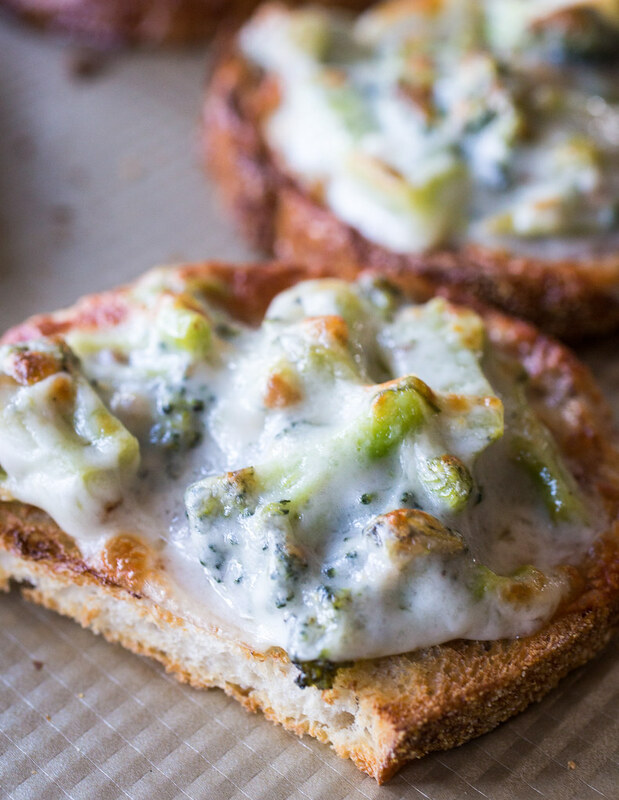 Made on crusty toasts, these open-faced sandwiches are toppled with a bright green, garlicky broccoli-cheese mixture that’s topped with MORE CHEESE. Then they’re broiled so quickly that you almost won’t even notice you had to turn on the oven! The cheese always melts so deliciously into the broccoli under the broiler, doesn’t it? 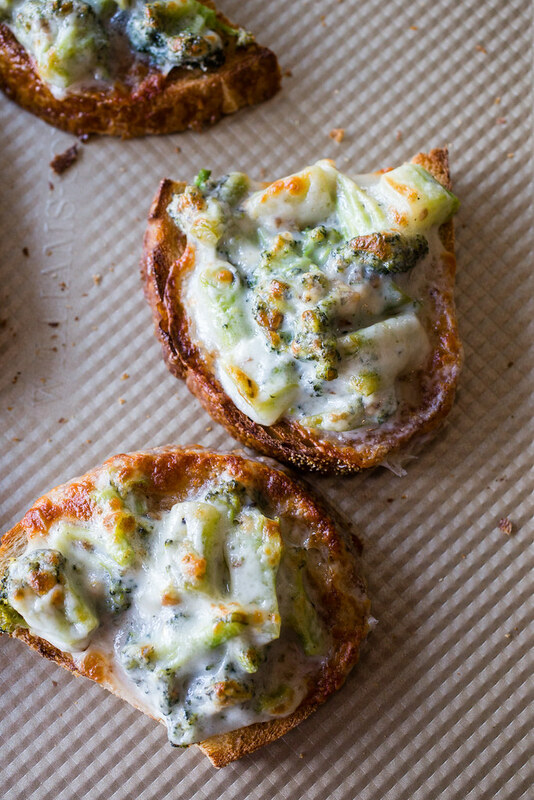 These broccoli melts are, by far, one of the best all-around meals we’ve made in quite a while. There’s a level of brightness from the lemon juice and a tiny bit of heat from the red pepper flakes that blend so well with the cheesy broccoli and the crispy toasts. The flavor is addicting. Like, completely addicting! We easily polished off half of the recipe by ourselves (just 2 of us!) so be prepared to make extra for your troops! 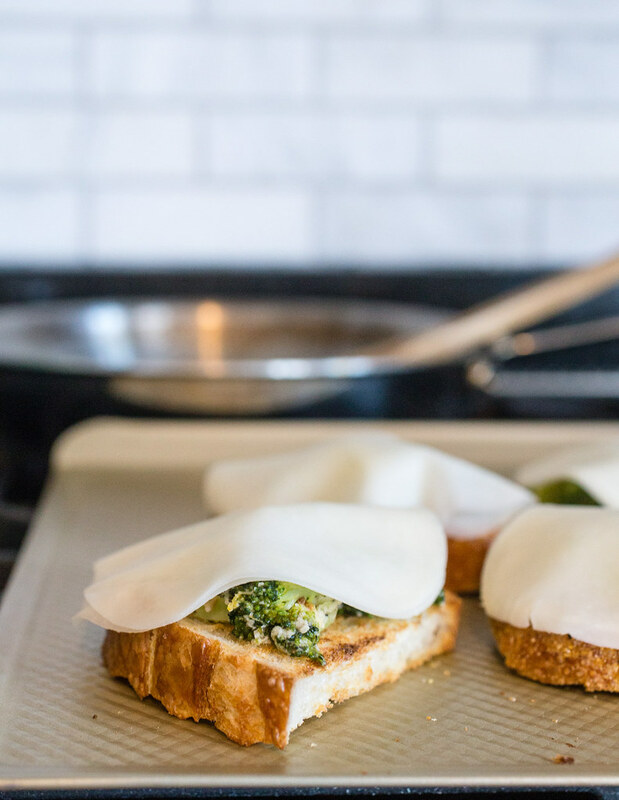 Quick and easy broccoli melts are for the nights when cooking a full meal just feels miles away. 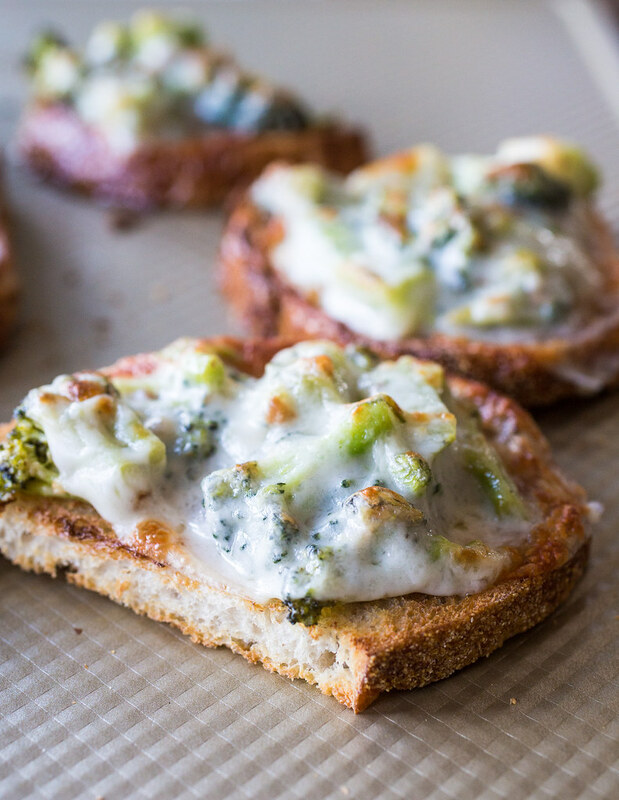 Quickly sauteed and garlicky broccoli set atop crispy bread and popped under the broiler to melt the provolone cheese, these open-faced sandwiches are an easy weeknight meal! If you're using broccoli with stems, peel the stems the cut into 2-inch pieces. (Skip this if using just the broccoli crown.) Fill a shallow pan with about 1 inch of water, bring to a simmer, toss in the broccoli, and cook the broccoli for 2 minutes. Drain the broccoli and wring out as much water as possible. 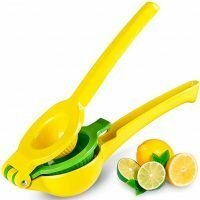 Chop into ½-inch pieces. Wipe out the pan to reuse. 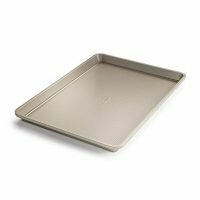 Preheat the broiler with a rack in the highest position in the oven. With the same pan over medium heat, heat the oil until shimmering and cook the garlic and red pepper flakes until fragrant, about 30 seconds. Toss in the broccoli and a good pinch of salt and cook, stirring occasionally, for another 1-2 minutes. Transfer to a bowl and mix in the lemon zest and juice, grated cheese, and salt and pepper to taste. Lay the bread slices out on a baking sheet and slip the sheet under the broiler, allowing the bread to toast to a golden brown and then flip to toast on the other side. 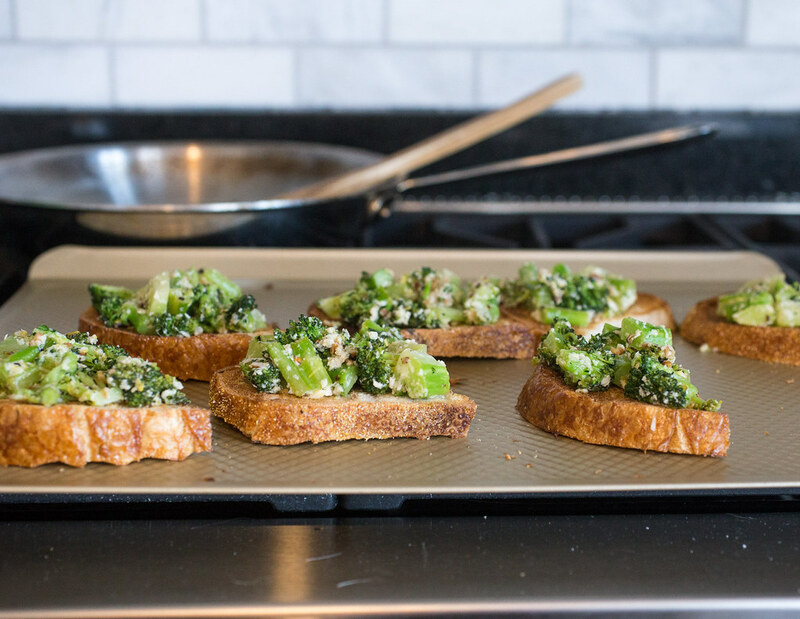 Pile the broccoli mixture atop the toasts and cover each with a slice of provolone. Return the pan to the oven and broil until the cheese is melted, spotty brown in places, and delicious. Serve while still warm. If you're big into raw broccoli (hi!! ), you could skip the initial cooking in Step 1. 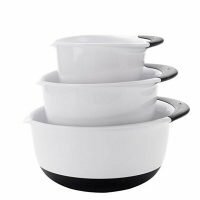 You'll retain lots of the nutrients lost by par-cooking and save yourself a few minutes as well.